I'm on vacation right now, right this instant. I'm sitting in the cottage, my grandfather is passed out on the couch in front of me, there's some boat show on TV and I can hear my grandmother busily preparing both lunch and dinner in the kitchen (yes, you read that right). My aunts, uncles and cousins are all expected to show up sometime today and it's going to be a big, crazy family get together. However as I have no internet, by the time you read this I will be home again, beginning the second leg of my vacation, which may or may not include, restaurants, day trips and uhm... more video games ... ('till all are one!). I made these muffins the weekend before my mother's birthday. Pumpkin bread is her favourite and she gets googly eyed everytime I bake it. But I didn't just want to make the same old again, I wanted to change it up a little, serve it warm, and surprise my mom for breakfast in the morning. So I decided to morph the recipe into muffins, something that can be done with most quick breads, but this time I would replace all the oil with Greek yogurt. It might not be the smartest thing to play with a recipe that someone loves so much, but given the success I've had with greek yogurt replacements and the general durability of quick breads, I figured it couldn't hurt to try. And it didn't, the muffins were pretty fantastic. They tasted identical to the bread, but the texture itself seemed softer. This was perhaps the result of making them muffins or the greek yogurt, either way it was no less delicious. The only drawback might be the lack of a crunchy top; but my mother, who is certifiable about these things, didn't even notice. There's nothing better on a Sunday morning than warm muffins and a cup of coffee, except when you add a batch of pancakes, which we did. 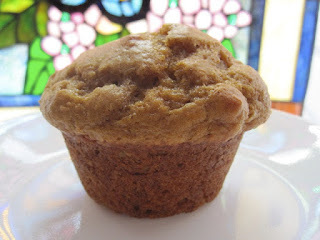 And don't let the fact that these are pumpkin muffins in the dead of summer sway you from making them. Spiced pumpkin baked goods and desserts are terrific for any time of year, and are always perfect first thing in the morning. Besides, don't most mornings feel like the dead of winter :)? Preheat oven to 375F and grease a standard 12 cup muffin pan. In a medium bowl add flour, cinnamon, nutmeg, baking soda, and salt and whisk to combine. In another bowl add pumpkin and sugar and combine completely. Add yogurt and eggs and and whisk to combine. Add vanilla and combine. Add dry ingredients to wet and with a wooden spoon mix until just combined. Pour batter equally into prepared muffin tin and set on middle rack. Bake for 15 to 20 minutes or until toothpick comes out clean (17 minutes for me). Remove from oven and allow to cool in pan on rack for 10 minutes before removing and serving. I've been on a blog vacation for a few months. Where are you?? I love pumpkin everything! I also think greek yogurt is a great replacement for some of the fat.